We live in a world where technology is all around us, and your customers are increasingly online. That's why the effective use of technology in a small business can help you attract customers and effectively compete in the marketplace. 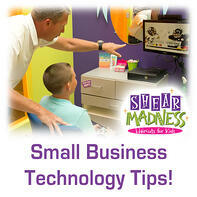 Following are some of our suggestions on how a small business can utilize technology to help promote growth and success! The use of a website: Having a well designed, easy-to-navigate website can help a customer learn more about your business. Be sure to use a website to share with customers what your business does, where it's located (with map), hours of operation, pricing (optional), and contact information (e-mail and phone). You may also want to use a website to run a blog related to what your business does, or share photos of what your store looks like. A website can also be useful in gathering information on customers, as forms - with a free coupon provided as incentive - can be utilized to collect customer data and help grow your business. There are many options for a website. Our advice is to get one that you will own! If you use a service that keeps the rights to your site, changing could become difficult in the future and may require a complete rebuild of your site. Selling Online: Interested in boosting profit margins for your business? If so, then why not consider developing a strategy for selling your products and services on the internet? In this day and age, not only can an online store be great for business - but many internet savy customers expect their favorite business to offer a convenient way for them to purchase items via website. And with sites like amazon and pinterest offering a relatively easy way to have an online store that can be linked to your website, there's really not much of a reason not to be selling online! Social Media: When combined with a website, social media is a powerful tool that helps you stay connected with customers. For example, through the Shear Madness Haircuts for Kids Facebook page, we interact with customers who want to learn more about our services, or let us know how we're doing. We also will run a fun weekly contest, and let customers know about upcoming specials. Of course, we'll also share our website so that customers can find out more details if they're interested! Go Mobile! Smart phones and tablets allow you to take your business on the road, and not miss out on a valuable opportunity to meet a customer need. Additionally, a smart phone or tablet allows you to stay connected to employees who are managing your store while you are away. Security: Sometimes in order to save money, small business owners might want to use personal phones and computers to run their business. However, for organizational and security purposes, it might be a better option to have devices specifically dedicated for business usage. And don't forget to create passwords that are a combination of upper case letters, lower case letters, numbers and special characters. Teleconferencing: Rather than spending a lot of time and money to travel to a meeting, sometimes teleconferencing can be a more affordable way to meet with clients. There's a variety of services available online, with some being free and others having a variety of low-cost payment options (such as control over moderation and recording). Take a look at what you'll need for an upcoming conference call, and research the options for what can deliver what you need for the best price. Tech Support: As your business grows, sometimes you might need the help of a tech professional in updating software, developing a more complex website or figuring out how to host important files needed for the successful operation of your business. When looking for technical support, be sure that this person or company will not only be easily available - but patient and helpful whenever you have a need come up. Sometimes, a local tech provider, as opposed to a provider in another country, might be the best option. If you are a small company you may want to look at using a domain provider that offers lots of support. Sometimes a call to them can save you from having to hire a professional.